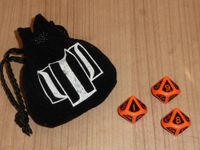 A black felt bag with ten ten-sided dice. The dice are red. The numbers are red, the surounding of the numbers (0-9) are black imprinted. The dice bag has the Trinity logo on it.